NOTE: Training posts are listed with the most current ones first. Contact each website or contact person listed for more details. These are a variety of resources for webinars. The webinars listed are coordinated by the West Virginia Department of Education, Office of Special Education, along with the West Virginia School Health Technical Assistance Center at the Joan C. Edwards School of Medicine, Marshall University. The Adolescent SBIRT project is a collaborative effort between the National Opinion Research Center (NORC) at the University of Chicago and various partners. Check out the 2019 SBIRT Webinar series. It is free and open to everyone. 3/14/19 – Adolescents, Young Adults and Opioid Use: When Is It a Problem? What to Do? 3/26/19 – Are Healthcare Professionals Ready to Address Patients’ Substance Use and Mental Health Disorders? 4/24/19 – Are Healthcare Professionals Ready to Address Patients’ Substance Use and Mental Health Disorders? The School-Based Health Alliance hosts webinars to connect members of the school-based health care field with public health experts. Our webinars are designed to help school-based health center practitioners provide quality health care services, build sustainable business models, and stay abreast of new topics in the health care world. Families gain what they need to be successful when five key protective factors are robust in their lives and communities. The Center for the Study of Social Policy (CSSP) introduced the Strengthening Families Initiative and Protective Factors Framework™ as a research informed, strengths-based initiative for promoting optimal child development and reducing the likelihood of child abuse and neglect. Gain awareness of Adverse Childhood Experience (ACES) and how Protective Factors may play a role in preventing or mitigating the effects of ACES. Define and recognize signs of parental resilience. Identify actions you can take to help parents build their resilience in your work. Give examples of program efforts to value and support parents. Give examples of program efforts to respond to family crises. Identify steps you will take to integrate these ideas into your work. Understand the value of helping parents and families connect to others in a variety of ways that reduce their isolation and increase their social supports. Discuss at least three ways that you can encourage parents to make these connections. Create some concrete plans to assist parents in developing new friendships and finding new sources of support – in the workplace or the community. Application is being submitted for WV STARS continuing education credit.CEU’s pending approval from the Office of Maternal, Child and Family Health for Nursing through the WV Board of Examiners for Registered Nurses, License # WV1999-0297RN, Social Work through the WV Board of Social Work Examiners, License # 490089. A $25 nonrefundable course fee, payable by check to TEAM for WV Children, is required for registration approval. This fee is necessary to offset cost of lunch and take-home resources (valued at $80 per participant). Please write “SFWV 6-28-18” in the check memo, and mail no later than June 18 to attention of Connie Kinsey, TEAM for WV Children, PO Box 1653, Huntington, WV 25717. 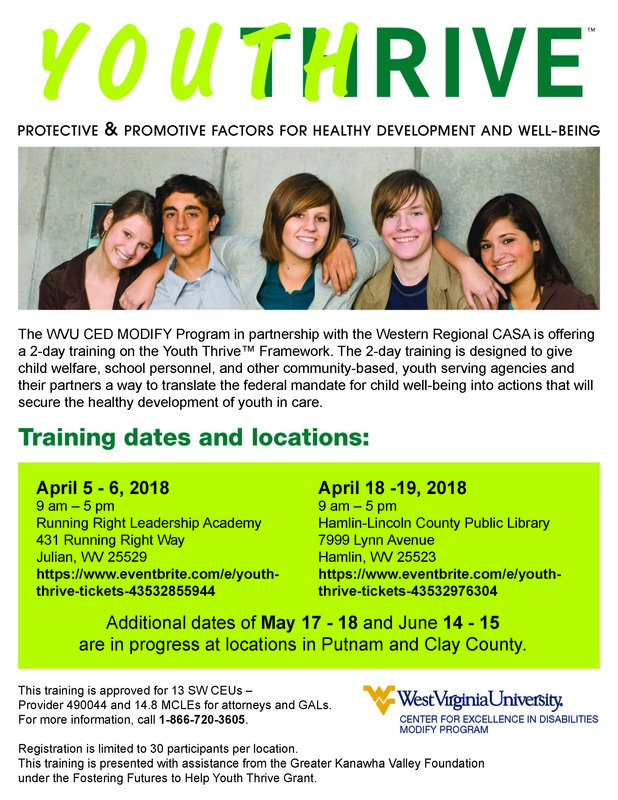 This training is offered with support from the West Virginia Office of Maternal, Child and Family Health through combined funding from federal Project Launch, Home Visitation and Early Childhood Comprehensive Systems grants. Buffet lunch will be served.SPACE LIMITED TO THE FIRST 50 INDIVIDUALS TO REGISTER! Application is being submitted for WV STARS continuing education credit. CEU’s pending approval from the Office of Maternal, Child and Family Health for Nursing through the WV Board of Examiners for Registered Nurses, License # WV1999-0297RN, Social Work through the WV Board of Social Work Examiners, License # 490089. A $25 nonrefundable course fee, payable by check to TEAM for WV Children, is required for registration approval. This fee is necessary to offset cost of lunch and take-home resources (valued at $40 per participant). Please mail no later than September 10 to attention of Connie Kinsey, TEAM for WV Children, PO Box 1653, Huntington, WV 25717. Strengthening Families West Virginia has also developed a workshop which has been approved for STARS, Social Work and Nursing continuing education hours. Designed to meet mandated training requirements for in-home family educators “Strong Roots & Good Soil” also provides a good orientation for child care providers, prevention specialists, family support professionals and others. West Virginia’s Strengthening Families orientation training is highly interactive and focuses on ways for workers to “enrich the soil” of positive relationships and everyday actions, to build “strong roots” for child and family well-being. 1. Early care and education providers, home visitors, caseworkers and others will learn about the Strengthening Families Approach and the Five Protective Factors, and why they are important to healthy child development. 2. The participant will learn the importance of the role of the Early Care & Education providers in helping families to build the protective factors through simple everyday actions, resulting in stronger families and communities. 3. The participant will be equipped to use specific approaches to enhance positive interactions and relationships with parents and caregivers, and to strengthen protective factors in children and families. A $25 nonrefundable course fee, payable by check to TEAM for WV Children, is required for registration approval. This fee is necessary to offset cost of lunch and take-home resources (valued at $60 per participant). Please write “SFWV Strong Roots 8-16-18” in the check memo, and mail no later than August 5 to attention of Connie Kinsey, TEAM for WV Children, PO Box 1653, Huntington, WV 25717. Participants will also receive a Strengthening Families Tote Bag and Toolkit that includes resource guides, and materials to demonstrate protective factors to families and community members. SPACE LIMITED TO THE FIRST 50 INDIVIDUALS TO REGISTER! The session in Cabell County will be July 30 – August 1, 2018 – Huntington. Please share with your school, community and other contacts listed below as appropriate. The nonprofit Greater Recovery and Community Empowerment (GRaCE) are providing the WV Recovery Coach Academies for school personnel including Diversion and Transition, community members working with schools, parents, grand-families, law enforcement, correctional officers and veterans. Registration and materials are FREE. Each participant will receive a certificate as a recovery coach, 3 free college credits from Blue Ridge Community and Technical College and CEs in nursing (Provider #WV1998-0231RN), school psychology and social work. Counseling and psychology CEs are pending. Each Recovery Coach Academy will be Monday – Friday from 9:00am – 4:00pm. Anyone interested in building skill sets to assist students and adults with adverse childhood experiences by removing barriers and obstacles to support their ability to be resilient and successful in life. The training also allows the Coach to serve as a personal guide and mentor for the student/individual to be successful and overcome these past and current obstacles. Recovery Coaching is a self-directed, strengths based model that assists school personnel/community members/parents/grand-families/law enforcement/veterans to empower students/individuals with the understanding that overcoming traumatic experiences is possible. It provides coaches with motivational interviewing and listening skills along with many other competencies to ensure today’s students/individuals are engaged and supported to be resilient and success. A five-day training will educate individuals to be Recovery Coaches in schools and the community to have the skill set necessary to provide trauma informed care. Each participant will receive a certificate as a recovery coach at the completion of the training. Thanks to funding and in-kind support, there is NO registration fee to school personnel including Diversion and Transition, community members working with schools, parents, grand-families, law enforcement, correctional officers and veterans. Materials, breakfast and lunch will be provided to those enrolled. In order to participate in the class, the person must have a desire to help students and citizens become resilient and successful. Class capacity is a minimum of 10 and maximum of 40. For more information or if you have questions about the training, email John Unger at WVRecoveryCoachAcademy@gmail.com. Each Recovery Coach Academy will be Monday – Friday, 9:00am – 4:00pm. Flexibility in the use of these funds is given to allow county level data driven decision-making and professional development opportunities, services and programs to support behavioral and mental health needs of students. Youth Thrive is a framework for working with adolescents who have experienced trauma, particularly those in the child welfare system. This training reviews the premises of trauma informed care, then delves into adolescent development, brain development and the 5 protective and promotive factors. The research behind this training comes from the Center for the Study of Social Policy – CSSP. 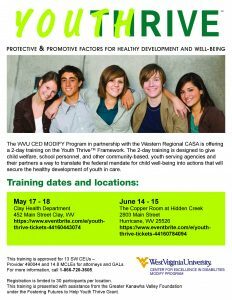 You can get additional information at https://www.cssp.org/reform/child-welfare/youththrive The training is provided thanks to a grant from the Greater Kanawha Valley Foundation for the “Fostering Futures to Help Youth Thrive” project. Space is limited so I encourage folks to register sooner than later. The training is free – lunch is provided – and the training has been approved for 13 Social Work CEUs and 14.80 MCLEs. Register/Information at the links below. If you have questions or special dietary needs, call 304-205-6426. The training dates and locations and information are below. 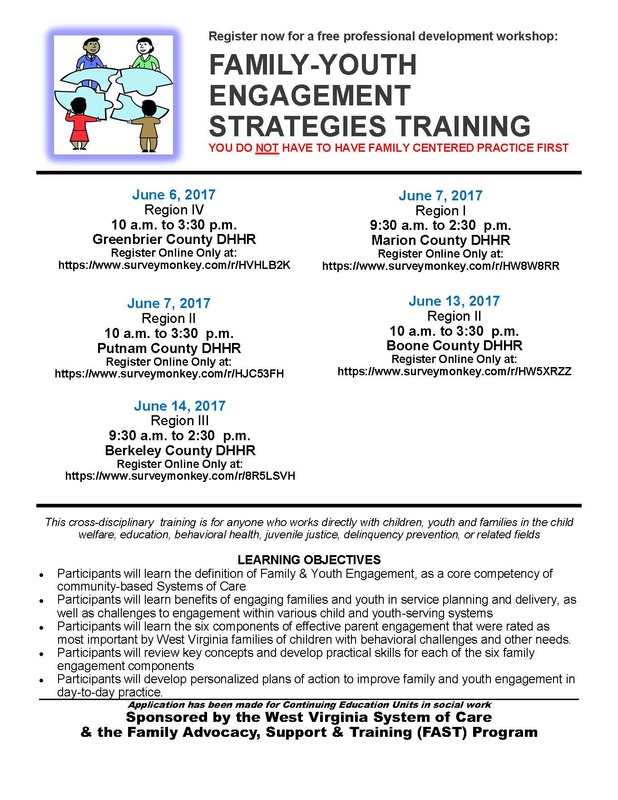 June 7, 2017 – 10 a.m. to 3:30 p.m.
June 13, 2017 – 10 a.m. to 3:30 p.m.
INFORMATION – All courses are offered free of charge with support from the West Virginia Office of Maternal, Child and Family Health through combined funding from federal Project Launch, Home Visitation and Early Childhood Comprehensive Systems grants. Families gain what they need to be successful when five key protective factors are robust in their lives and communities. The Center for the Study of Social Policy (CSSP) introduced the Strengthening Families Initiative and Protective Factors Framework™ in 2003 as a research informed, strengths-based initiative for promoting optimal child development and reducing the likelihood of child abuse and neglect. “Bringing the Protective Factors Framework to Life in Your Work” courses are certified training modules of the National Alliance of Children’s Trust and Prevention Funds, for early care and education, prevention, family support and other health/human service professionals. Open trainings are approved for WV STARS. CEU’s pending approval from the Office of Maternal, Child and Family Health for Nursing through the WV Board of Examiners for Registered Nurses, License # WV1999-0297, Social Work through the WV Board of Social Work Examiners, License # 490089. All courses are offered free of charge with support from the West Virginia Office of Maternal, Child and Family Health through combined funding from federal Project Launch, Home Visitation and Early Childhood Comprehensive Systems grants. This in-person adaptation of the Alliance’s popular on-line training on the Protective Factors Framework includes the primary content from the online training with new interactive activities added to benefit from adult learning styles in group settings. For more information about In Person Strengthening Families/Protective Factors Framework learning opportunities, email info@strengtheningfamilieswv.org. Courses Presented by Certified Trainers of the National Alliance of Children’s Trust & Prevention Funds. CEU application will be made for STARS WV Continuing Education credit; Registered Nurses and Social Work. Click here to Register by August 10. Click here to Register – The registration deadline has been extended through Monday, August 15. Click here to Register by August 18. Click here to Register by August 22.
developmental impacts of trauma, and pathways to child and family well-being. TEAM for West Virginia Children, with support from the West Virginia Office of Maternal, Child and Family Health through combined funding from federal Project Launch, Home Visitation and Early Childhood Comprehensive Systems grants. SPACE LIMITED TO THE FIRST 33 INDIVIDUALS TO REGISTER BY AUGUST 22, 2016! Online Registration is Required for Each Participant; As a mixed-agency training, a single agency’s employees must not exceed 40% of total registration. If direct links above do not work, please paste or type the URL address into your browser. If you need further assistance, please email wvsystemofcare@gmail.com. Family Centered Practice Basics is designed for ALL EMPLOYEES of child and youth-serving agencies and systems, as well as interested family/youth representatives of those agencies (such as. foster parents, advisory board members, etc.). 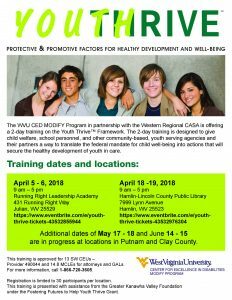 DO NOT REGISTER FOR THIS TRAINING IF YOU HAVE PREVIOUSLY TAKEN “FAMILY CENTERED PRACTICE” OR “FAMILY CENTERED PRACTICE BASICS” TRAINING IN WEST VIRGINIA. Participants will learn how Family Centered concepts apply to their practice whatever their role in their agency or system, as well as to policies and programs to improve service to families. Participants will come up with several behavioral changes they can immediately apply to their day to day work. This powerful training is open to any adult who cares about or serves in a position of responsibility with children and youth, including scout groups, sports leagues, schools, child care settings and those working in ministry. Child sexual abuse is likely the most prevalent health problem children face, with the most serious array of consequences. In fact, 1 in 10 children will experience sexual abuse before their 18th birthday. This means that whether you work with youth, are a parent, or are simply a member of a community, it is highly likely that someone you know and care for has experienced, or is currently experiencing, child sexual abuse. It’s going to happen whether you are prepared to deal with it or not – unless you stop it from happening. And the good news is, it can be stopped. Stewards of Children is an award-winning program that teaches adults to prevent, recognize, and react responsibly to child sexual abuse. In case of inclement weather (specifically, if Cabell County schools are closed or release early on February 18), the training will be rescheduled for Feb. 25 at the same time and location. West Virginia’s new Strengthening Families training is highly interactive and focuses on ways for workers to “enrich the soil” of positive relationships and everyday actions, to build “strong roots” for child and family well-being. 1. Early care and education providers, caseworkers and others will learn about the Strengthening Families Approach and the Five Protective Factors, and why they are important to healthy child development. Application has been submitted for WV STARS continuing education credit, as well as Social Work and Nursing hours. Participants will also receive a Strengthening Families Tote Bag and Toolkit (valued at over $50) that includes resource guides, and materials to demonstrate protective factors to families and community members. SPACE LIMITED TO THE FIRST 36 INDIVIDUALS TO REGISTER! To complete your registration, please mail a check with $15 registration to TEAM for WV Children, PO Box 1653, Huntington, WV 25717. September 15th – 9:00 a.m. – 4:00 p.m.
September 16th – 9:00 a.m. – 12:00 p.m. TESTING: September 24th – 9:00 a.m. – 12:00 p.m.
and The West Virginia Bureau for Public Health. Description: This workshop will present an overview of trauma; its biological, psychological, and social impact on children; and strategies to help children and families who are affected by trauma. Application is being submitted for WV STARS and and Social Work continuing education credit. Please register your attendance by Sept. 11th. NOTE: Should you have trouble with the registration link, you can paste the address below in your browser. 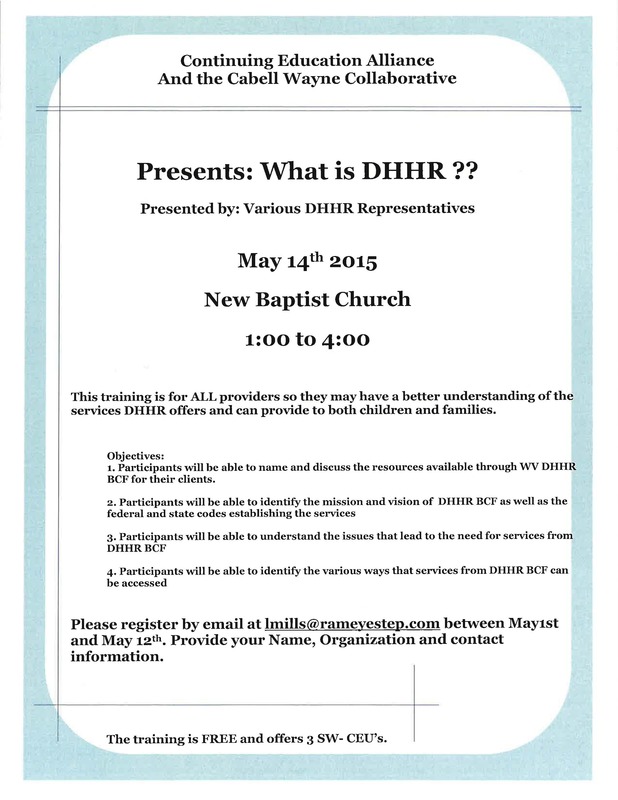 This training is made possible through a Strengthening Families mini-grant with funding through WV DHHR. If you have any questions, email Debra Harris Bowyer, Coordinator, at dbowyer@cabellfrn.org. Please forward this information to other staff that would also be interested. on April 28th at the Charleston Civic Center as part of the State Home Visitation Conference. Learn more about the Strengthening Families framework to build protective factors that prevent child abuse and neglect, as well as enhancing quality of early childhood programs in their work with children and families. West Virginia’s new Strengthening Families training is highly interactive and focuses on ways for workers to “enrich the soil” of positive relationships and everyday actions, to build “strong roots” for child and family well-being.Application has been submitted for WV STARS registration for 4.75 hours of STARS credit.If you have any questions or would like additional information, please contact Jeanette Rowsey, Strengthening Families WV Coordinator at 304-736-4366 or email info@strengtheningfamilieswv.org.We hope to see you on April 28th. Please RSVP, so we can plan accordingly. Space is limited, so please register today! Thank you for your support for WV children and families! Online Registration is Required for Each Participant; As a mixed-agency training, a single agency’s employees (such as WV-DHHR) must not exceed 60% of total registration. If direct links above do not work, please paste or type the URL address into your browser. If you need further assistance, please email wvsystemofcare@gmail.com. Family Centered Practice Basics is designed for ALL EMPLOYEES of child and youth-serving agencies and systems, as well as interested family/youth representatives of those agencies (such as. foster parents, advisory board members, etc.). This training is approved for Continuing Education Units in Social Work. 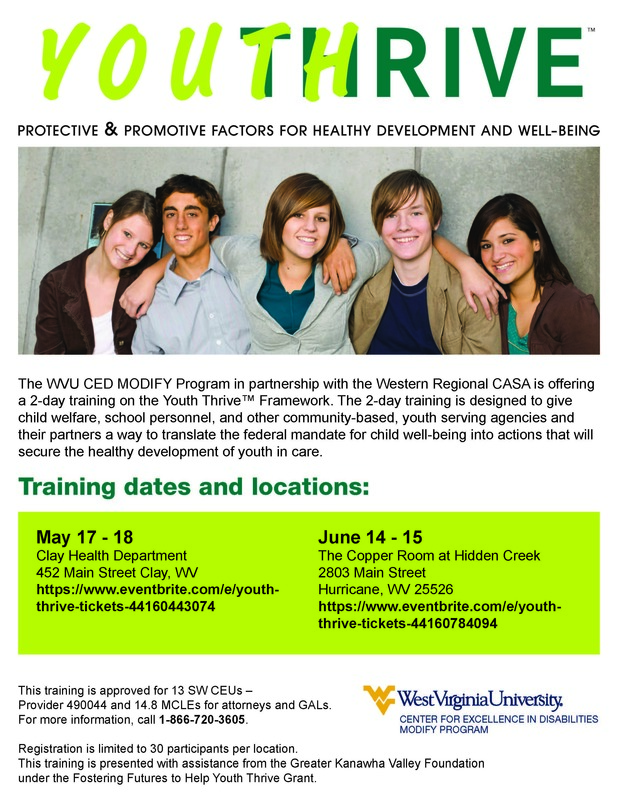 This free training is made possible by the WV System of Care partnership. This session meets the learning objectives for original WV Family Centered Practice training in an updated, half-day revision for 2013 & beyond!